WUHAN -- Chinese officials and experts have admitted the Three Gorges Dam project has caused an array of ecological ills, including more frequent landslides and pollution, and if preventive measures are not taken, there could be an environmental "catastrophe". 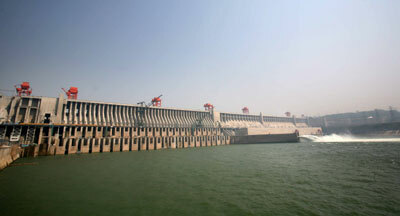 While the dam has served as a barrier against seasonal flooding threatening the lower reaches of the Yangtze River and the electricity generated by hydropower has led to a decrease of 100 million tons of carbon emissions, the benefits have come at an ecological and environmental cost, officials said. All the participants in a two-day forum held in Wuhan on Tuesday agreed that the project had exerted a "notably adverse" impact on the environment of the Three Gorges reservoir, with a total circumference of 600 km, and along the Yangtze since last year, when the project began operation. They said the huge weight of the water behind the Three Gorges Dam had started to erode the Yangtze's banks in many places, which, together with frequent fluctuations in water levels, had triggered a series of landslides. "If no preventive measures are taken, the project could lead to catastrophe," they said. Tan Qiwei, vice mayor of Chongqing, a sprawling metropolis next to the reservoir, said the shore of the reservoir had collapsed in 91 places and a total of 36 km had caved in. Frequent geological disasters have threatened the lives of residents around the reservoir area, said Huang Xuebin, head of the Headquarters for Prevention and Control of Geological Disasters in the Three Gorges Reservoir. At the forum he described landslides around the reservoir that had produced waves as high as 50 meters, which crashed into the adjacent shoreline, causing even more damage. Clear water discharged from the Three Gorges Dam has also threatened the safety of the protective embankments downstream, according to Hubei Vice Governor Li Chunming.